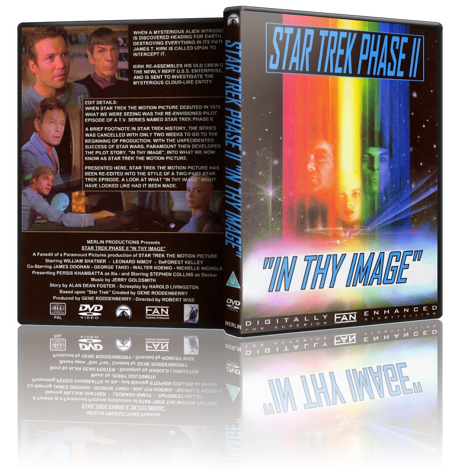 - Added: An introduction to Star Trek Phase II, and Star Trek style titles & end credits â€” specially created for this edit. - Added: 1970′s style Paramount/Gulf & Western logo. - Cut: Star Trek The Motion Picture’s opening titles ... as previously mentioned, these have been replaced with new opening titles more in keeping with a Star Trek TV episode. - Moved: The Klingon/V’Ger & Epsilon Station scenes now become the traditional Star Trek pre-title teaser. - Cut: The meeting between Kirk and Sonak at Starfleet Headquarters ... This is a lovely sequence, and a good first look at Starfleet Headquarters in San Francisco. But it was necessary to cut this scene, not only to help cut time, but It was necessary to cut the character of Sonak out of the movie all together (see below). - Moved: Kirk arriving on the orbiting office complex, and his subsequent inspection of the Enterprise. - Cut: The chaos on the bridge as Kirk arrives on the turbolift ... I never felt this was right. These are professional Starfleet crewmembers, they shouldn’t be shouting and in a state of uproar. - Moved: Spock on Vulcan. - Cut: The transporter accident ... Again, I never felt this was right for Star Trek, it is quite gruesome and I don’t feel it belongs. It is because I had decided to cut this, that it was necessary to cut Sonak out of the movie as this accident involves him. - Cut: Ilia’s miraculous healing of Chekov’s injury ... it was never explained why Ilia could do this, and I always thought it looked a bit odd, and so it was cut for timing purposes. - Cut: Approximately half of the V’Ger cloud flythrough ... for timing purposes. - Cut: Approximately half the V’Ger spacecraft flyover ... for timing purposes. - Cut: Some bridge scenes and exterior shots just after the Enterprise has been pulled inside the V’Ger spacecraft ... for timing purposes. - Cut: The Enterprise recreation room scene with Decker and the 'Ilia' probe ... for timing purposes. - Moved: Spock sneaking into the airlock room and neck pinching the crew member there. - Moved: Ilia’s quarters scene. - Cut: Star Trek The Motion Picture’s end credits (including the “and the human adventure is just beginning” caption) ... as previously mentioned, these have been replaced with new end credits more in keeping with a Star Trek TV episode. - Numerous other small cuts and edits for pacing and timing purposes. It would be interesting to point out here that I had also planned on cutting out all the bitterness and rivalry between Kirk and Decker. This didn’t work out because I found that after I had tried to cut the first scene between them in engineering (the argument between them when Decker finds out that Kirk is taking command), there was no suitable following scene that introduced Decker in the right way. Also had this cut been made, Ilia’s wonderment at Decker only being first officer doesn’t appear to make much sense. Firstly let it be known now that I am not a big Trekkie fan. I like the older 60's show and will watch them when I happen to catch it on television. Other than that the extent of my Star Trek knowledge is very slim. I am stating this because I want you, the reader, to understand that this review is not coming from someone who is fanatical about the series. With that out of the way let's get started. In 1979 my parents took me to see this clunker of a film. Being seven at the time most of what was going on went over my head. In the end I had always found the film to be boring. In fact Merlin's edit may be the first time I have seen this film in over 20 years. Sure I have the original dvd lost in the house somewhere, but who really has the time to actually watch everything you purchase? I know I don't. PLOT: this was already listed by the fan editor Merlin and more so by killbillme’s review. I tend to disagree a bit with his review and this prompted me to write my own thoughts on the edit skipping the plot since this was already covered. VIDEO MENUS: One sour point some had is that you have a lot of reading on the disc. In fact, once you play the dvd you are given a somewhat lengthy review of actually what this whole edit is about. I enjoyed reading this since I am not a big Star Trek fan. Skipping this is easy, just push the menu button on your dvd remote and you are taken to the main menu. Merlin made some nice menus to resemble a control panel complete with sound effects from Star Trek. Here you can select the first or second part of the film or see the intro credits again. Once you select which film part you want to watch you are brought to the chapter select screen. Merlin made the first chapter for each episode the plot outline for what you are about to see with more reading. If you want to skip this, select/go to chapter 2 (yes it is that easy) and the title of the episode shows and it begins. My only gripe with this is that the reading material should have been a chapter on its own and not connected to the episode outline, but really it is not a big deal. The picture quality is quite nice. Although it does seem a little soft, but that may be inherit from the source material used. Each episode has various fades that if shown on television would direct you to where each commercial break would go. My only real issue with the video is that on a majority of scene changes, right before a change the last frame is blue. This may be from the editing app or possibly if it was encoded, the encoder not handling scene changes properly. It does occur throughout the entire feature but because it is only one frame it is not distracting. He also remade the beginning and end credits appear like this in fact was a tv show, which I thought was well done. Ok here is where I have a slight issue. PEOPLE PLEASE take the time to make sure everything is in sync. The first episode starts in sync and then slowly goes a few milliseconds off. It stays that way until 42 mins or so when it appears to go back on track. Likewise the second episode on the disc has similar issues (though not as much as the first episode). It is not off enough to be very distracting but enough so for me to notice it. The second issue I had is to what killbillme described as high pitch helium voices. I can hear what he is talking about. It's not that blatantly high in pitch but the pitch seems to be a bit higher than it should be. My only solutions for this are perhaps this is one of the very rare times when you can actually hear the 4% speed up rate from a US film in PAL format. Then again perhaps his source was ntsc and he converted it over to pal and adjusted the audio as such. I am not sure what the reason was, but it is there and you can hear it. 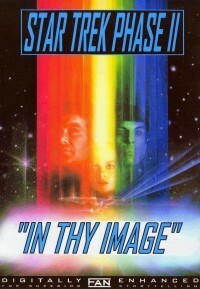 I think Merlin succeeded in doing what he wanted to do: Make the original Star Trek movie like the two episode tv pilot it originally was supposed to be. In the process of this he took a film I never really liked and made it enjoyable for me to watch. Despite the technical flaws with this edit, I am giving it 4 out of 5 stars. If a non Trek fan found this to be enjoyable, the chances are you will too.